Crazy shoes. They’re all the rage! Yesterday in Milan, Miuccia Prada debuted a series of Lucite and plastic chandelier shoes with a rainbow of heel colors and swinging crystals. Equipped with what looks to be a velcro strap, the Prada footwear looks somewhat comfy—at least they didn’t send the models tumbling, as did Rodarte’s Nicholas Kirkwood stilettos. Fancy yourself a 21st century Cinderella? 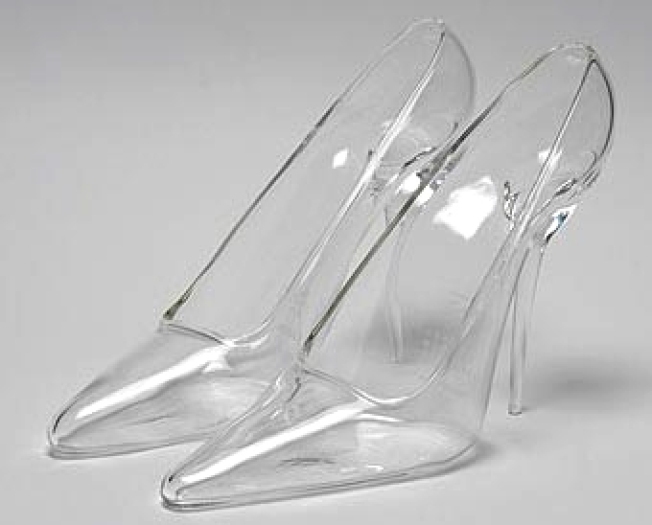 These clear faux glass slippers from Maison Martin Margiela will suit you perfectly. That is, if you have $1,300 lying around. Oh, and that will only buy you one. If you want to shod both your feet, you’ll need to shell out around $2,500. But who cares? You’re a princess! Susie Bubble has her eye on these decidedly goddess-esque winged platforms from Vivienne Westwood’s Red Label collaboration with Melissa. For around $200, you can teeter around town in these straight-off-the-runway clomper-stompers come November when they arrive in stories. NB: If you don’t want to fly around like Hermes every day, the wings are removable.